When a driver hits another vehicle, a pedestrian, a motorcycle or a bicycle, we expect that the individual will have enough decency to check on the injured victim and ensure that appropriate assistance is given. Unfortunately, far too many drivers choose to leave the scene of an accident without taking any measures to communicate with the victim or secure medical assistance. Leaving the scene of a vehicle accident is against the law, but it may also be grounds for a compensation award to the victim. 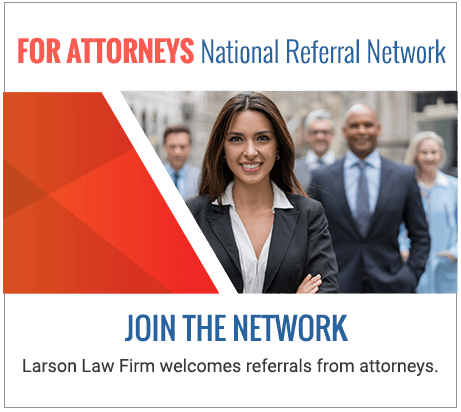 At the Larson Law Firm P.C., our skilled North Dakota hit-and-run injury lawyers understand the complexities behind a hit-and-run claim. We have helped numerous victims obtain compensation for their injuries, and we are ready to help you as well. What is a hit-and-run car crash? A hit-and-run occurs when a vehicle driver fails to stop at the scene following a traffic accident. It is a nationwide problem, with the majority of incidents affecting pedestrians and bicyclists. Even a low impact hit-and-run can have extensive medical implications for a victim. Depending on the severity of injuries, an innocent person may be left with chronic physical pain, long-term psychological trauma, expensive medical costs and the inability to return to gainful employment. The most tragic of these incidents result in death, leaving family members to deal with the pain of knowing that someone’s negligence and callousness caused their loved one’s death. Generally, when car accidents cause injury, the victim pursues compensation from the at-fault driver’s insurance company. With a hit-and-run accident, the victim may have no way of identifying the driver. This can create a dilemma when seeking monetary compensation. Under North Dakota law, drivers are required to carry uninsured motorist coverage. This coverage can be used to make a hit-and-run claim. The legal team of the Larson Law Firm helps you through this process, so you can focus your attention on healing. We have a proven track record of success against powerful insurance companies, and we never back down from a fight. For pedestrians and bicycle riders, the claims process can prove a bit more challenging, so it is important to secure the services of a knowledgeable team. We work diligently to obtain compensation for the extensive physical, mental and financial hardships that stem from an accident. Do not let anyone tell you that there is no financial remedy for your hit-and-run accident injuries. At the Larson Law Firm P.C., we fight to get the compensation you need to afford the medical treatment your injuries require. We provide legal services to hit-and-run victims across North Dakota, including the residents of Ward, Williams, McKenzie, Pierce and Mountrail Counties. Our Minot office is easily accessible with convenient parking available. Contact us via our contact form or by telephone at 701-484-HURT.